Not only is much of today's news centered on hot-button issues, but the new providers themselves have become a hot-button issue. As GM of CBS News Radio Network, Craig Swagler oversees an organization that collects news and disseminates them to radio stations in a variety of programs and on a variety of platforms. Yet like every other media entity lumped into the term, "mainstream news," CBS News Radio has come under fire for reporting "fake news" on incidents or issues that go against the mindset of a certain segment of the audience. Here, Swagler describes the efforts CBS has made in offering quality, verified information in a very polarized and antagonistic political climate. When you took your current GM post, what did you feel your main challenges in News Radio were? CBS News Radio entered a new world where we took on affiliate sales, changed our advertising sales representation, and implemented a new satellite delivery system. Job One was to ensure a seamless transition for our hundreds of affiliate radio stations and millions of listeners who depend on CBS News Radio to deliver the very best in audio journalism. We were now in control of our own successes and as the GM, I needed to guide our team to be laser-focused on our goals. Did you have specific ideas on what you wanted the News division to accomplish ... did you want to do something different? CBS News Radio has always been the home for excellence in journalism and is regarded as the "gold standard" in News. Part of my job was to ensure that we continued to hold ourselves to the highest standards while maintaining relevance for our affiliates and our audience. The launch of CBS Connect, a suite of products and services designed for music-formatted stations, allows us to bring the best in information in a way that complements the brand promise of FM affiliates. We offer a multitude of options so stations can customize the news and information they offer to their communities and audience. Do you tailor your News reports to fit the format of the station? We saw a real unmet need in the marketplace for news reporting that aligned with the goals of music-forward stations when we created CBS Connect. Based upon conversations with hundreds of stations, we designed a flexible new delivery system that stations can customize in length and duration. We also identified news anchors whose choice, writing, and voice mesh with the mission of our affiliates. Do you customize CBS Connect content for specific formats, or for specific demos that are the target of the formats? We don't specifically customize every piece of content that way, but we look for content that fits multiple different formats or demos, then we make sure there's enough variety of it on a daily basis to fit the different stations that have those needs. So you're not doing different versions of the same story to fit certain formats or demos? No, because at the end of day, news translates universally regardless of the age group -- at least that's what we believe. Good storytelling goes across all demos. That being said, there's definitely a style that's more conversational and relatable. We go for the unique in how we tell stories in the Connect format. That's the key idea here. On music stations, we're trying to put a conversation into action and by doing so, we're enhancing those stations' ability to connect with listeners. It's difficult for modern-day music stations to dedicate any length of time to spoken word. They want to make as few stops as possible to keep their listeners tuned in and engaged, which forces us to create original content that's an interesting and compelling conversation starter. We strive to do that every day, to fit the station's fast-paced engagement. Do you have the resources to tailor your programming to cover for regional or local issues? Yes. We do that now. We work hand in glove with our affiliates to bring our talented roster of correspondents to their local story and bring the station's local coverage to the national stage. Has radio's needs for News changed over the years ... and how have you changed to accommodate their needs? Radio continues to change. We are in constant communication with our affiliates to make sure that the product we produce meets their needs. One size never fits all. By providing consistent high-quality content in a variety of formats, lengths and delivery, we continue to meet the needs of the evolving marketplace. Is the radio news field more competitive than before? How has that environment impacted the way you do things? It depends on how you define your competition. It's undisputed that there fewer news providers in broadcast radio compared to 10 and 20 years ago. The real competition for CBS News Radio isn't on the AM/FM dial, so we have to provide our affiliates with all of the tools they need to thrive in an ever-fractured media landscape. If your rivals aren't on the dial, exactly who is your main competition? Our competition is any entity that delivers information and news in a variety of different formats. What I mean by that is while there's a lot of really good content generators in the information space, whether it's the Washington Post, the New York Times or ABC News, it's more about flipping through the thought processes on how information is being delivered. The mobile phones in our pockets have become competition in the sense of how people receive news. We're keeping in the game by being relevant in the digital space. We're also changing the way we define ourselves. Before, any news source defined itself by the appliance it was on, but we're trying to define ourselves as content generators in the audio space ... and not just as radio broadcasters. That's an extremely important part of what we do -- reach the largest audience that exists in U.S. -- so we produce high-quality audio content that can be effectively placed on multiple platforms, be it a smartphone in a shirt pocket or the dashboard of a car. How have the nature of your relationship with affiliates changed over the years ... and how have you dealt with that? Our relationship with our affiliates has always been one we view as serving their needs. Amy Bolton, our manager of affiliate sales, assembled a top-flight team with decades of experience providing essential service and support to our network of radio affiliates. That substantial change benefits us and our broadcast partners because we now have direct communication and instant feedback. We know that the reason we are the winner of more Murrow Awards than any other radio news network is because of the outstanding stations that make CBS their network news provider. We never lose sight of the fact that it is a true partnership. Has the current polarized political climate impacted your reporting? Has there been any feedback from affiliates or the public about what you report on or how you report it? The current political climate is nothing new, but it does sharpen the focus of the important role we play in our democracy. An open and free press is what makes us a republic; our founders insured that right in the First Amendment of our Constitution. Our affiliates and our listeners trust that CBS News is real news, with original unbiased reporting. Be that as it may, the political environment seems to be so antagonistic that more than a few people consider any report that refutes what or who they believe in as "fake news." Does that concern you? Or is that more of a marketing issue than a content one? It is concerning from a journalistic standpoint. The concept that legitimate journalistic organizations, which have been around a very long time, are now being described as an "enemy of the people" ... that's very concerning. The whole ethos behind a free and open democracy is the idea of a free press - and that's not just because enterprising capitalists can make money by distributing information. The idea is that independent organizations can gather and disseminate information that can be verified, quantified and real. The key point here is that this administration has attacked news organizations for doing just that -- and that's a problem ... a problem for our business and our country. Should fact-checking the words of the newsmakers be part of the news reporting? The very foundation of journalism is delivering truth to the public. That means we fact-check everything that comes out under the CBS News Radio banner, which is our duty to the people we serve. So, for example, a political figure makes an allegation that has been previously reputed. Exactly how would a CBS News radio report mention that falsehood? We have to fact-check what everyone says. When anybody makes a claim or statement, whether in a newsmaker sense it's a public official or a businessman, we want to present what they have to say in context. What an individual says is weighted by who they are as an influence. Obviously, a politician or lawmaker has more weight in what they say than a private citizen, so we present what they claim in context of what might be counter to it, either by presenting someone else's views, or statements to facts. Every situation is different; you also have to be careful and realize that there can be a lot of grey in everything -- and that's part of our responsibility as journalists. When we do present people and the assertions they make, we need to have the ability to put it in a wider context. How has disaster reporting changed over the years? Our world is much more interconnected today than ever before. That is why CBS News deploys journalists whenever, wherever, disaster strikes. CBS News Radio is there with original reporting from our correspondents, whether it's Peter King in Pensacola or Steve Futterman in Santa Rosa, CBS News brings the critical information home to our listeners. Does CBS have some sort of litmus that differentiates a simple news story, be it a tornado touching down somewhere or a police shooting, from an all-points bulletin, such as a major hurricane, announcement of a major indictment, etc. Is it tough to decide what deserves far more than the usual coverage? It often comes down to how it impacts people's lives. That's the ultimate litmus test of how much energy we put into it. It's not always a breaking news story, although that's important. A tragic natural disaster naturally gets so much attention because it can impact a lot of people's lives. We can put out hundreds or thousands of individual stories that can be told over a long period of time; how it affects people personally in turn impacts their communities. We know how make that relatable to the rest of country. We don't just tell people what they need to know; we also tell them what they want to know. What characteristics separate the great news anchors from the just passable anchors? Our anchors never lose sight of their connection with each individual listener and the responsibility to deliver the news in a way that not only educates and informs, but also touches the heart and stirs the soul. How does CBS News Radio utilize the digital platforms in its programming? We have a tremendous asset with CBSN, our 24-hour streaming news channel, which we are working to make available to our news affiliates for their websites. In addition, we offer video content of iconic programs like Entertainment Tonight, Inside Edition, and Rachael Ray to our news affiliates. Is podcasting something you see CBS News Radio utilizing in a major way? Absolutely. CBS News Content is heard everywhere on numerous platforms. Podcasting is an additional distribution arm that is now firmly entrenched in the audio marketplace. What percentage of your podcast content is repurposed news stories and how much is original content separate from what you use in your normal news programming? A good portion of our podcasting, more than 50%, is original content. One of things that makes a good podcast -- just as it does in broadcast radio -- is that it's relatable, that it brings out the personal story. The whole philosophy behind podcasting is having unique content where the personality is speaking to listeners in way they can't get anywhere else, which would prompt them to spend 45 minutes to listen to that content, which has to be actionable and compelling enough to make the listener take action. While a good portion of our podcasts are original, that's not to say that many of our high-quality radio broadcasts have that same thread in them and would work well as podcasts. We take time to make sure that content would work in that space. We don't believe in just taking radio broadcasts and slapping into podcasts. We do take care in making original content for podcasts that can have multipurpose use baked into them. For instance, in one program, "The Take Out," each week White House correspondent Major Garret goes to restaurants in the D.C. area and sits down with influential people in politics or pop culture for hour-long conversations on a variety of subjects. "The Take Out" is a play on words where they have very personal conversation while going out to lunch. It's also taped for videos, so it has a multi-functional purpose. By baking in a multi-functional component from conception to production is very important to create something original and not something that sounds repurposed. Where do you see the future of radio news going - and how do you see CBS News Radio staying on top or ahead of the curve? It may sound anachronistic, but I think a key advantage of CBS News Radio is our unwavering commitment to accuracy. 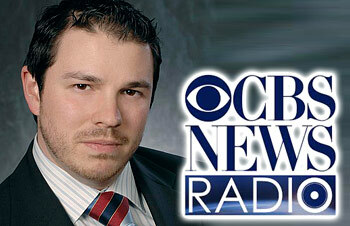 While the goal of some news outfits may be to "Get It First," CBS News Radio will always be "First, Get it Right." CBS News Radio has broken some pretty big stories this year like Steve Dorsey with the Cuba story of sonic attacks on our diplomats. A lot of news organizations are cutting corners and staff. With more correspondents and reporters across the country and around the globe, CBS News is committed to delivering the high standard of news our affiliates deserve.